Pik India is manufacturing White Duct Hose Since 1978. Acknowledged as the pioneer in non-tyre product innovation and is prime supplier to Defence, Industrial, Automotive and Consumer Markets. 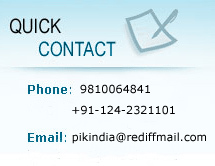 Pik India manufacture the widest range of white duct hose for Mineral, fuel oil, Steam, Air, Gas, Water and other liquids and fluids and manufacture other hose tube and pipe for numerous Industries as per their design and specifications.